In 1988, soon after arrival in Australia, Mammad Aidani wrote A Few Steps Not Here Not There. The text is bound by an exilic narrative of displacement, of being a stranger experiencing invisibility and an interloper in a foreign country, of being neither here nor there. The text later became a play, first performed in 1997 at La Mama in Melbourne, with a second production in 2002 at Arts House Meat Market in Melbourne, and a third production due at La Mama again in late 2015. 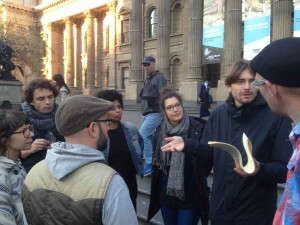 Aidani has been working with Iranian asylum seekers and refugee artists who have recently arrived in Melbourne. With backgrounds in Iranian film and theatre, Omid Movafagh, Mike Fard and Mohsen Panahi formed a small group that became immersed in Aidani’s text as a prism through which to find locations of affinity and belonging. Together the group made a short film. This new installation of A Few Steps Not Here Not There creates an intimate setting for experiencing the looping film and encountering the original text. Together, these layers of the installation reveal two generations of asylum seeker experience endeavouring to come to terms with trauma, hopes, movement of identity, and forms of self-authorised creative expression that negotiate cultural displacement. A Few Steps Not Here Not There, RMIT Gallery, 2015. Photography: Mark Ashkanasy. A Few Steps Not Here Not There, still image from 7min digital video, 2015. A Few Steps Not Here Not There, RMIT Gallery, 2015. Performing Mobilities challenged audiences to take the leap from being passive to active participants – literally. Many works were only fully activated with physical engagement. Audiences don’t want to give the ‘wrong’ answers, but we all take our own subjective interpretations into exhibitions, and can’t help become intellectually and emotionally involved in the work if we find it speaks to us. A Few Steps Not Here Not There by Mammad Aidani, Omid Movafagh, Mike Ford, Mohsen Panahi and Hada Kazemitame, invited audiences to engage not just intellectually but emotionally and empathetically. The installation explored asylum seekers’ experiences of displacement, with group members using Aidani’s narrative of exile as a way to negotiate their own responses to the longing of the past and the uncertainty of the future in a new country. What does it take to belong in a new place? How does one find familiarity in a new location? Located in a narrow exhibition space at RMIT Gallery, the installation provided a theatrical space with black walls that enveloped the audience and focused attention on an illuminated chair facing a screen that played the looped short film. 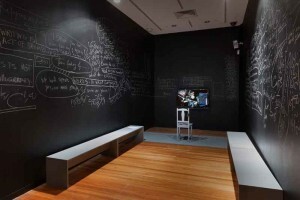 This intimate setting included two facing bench seats, forcing the audience to look at each other while reading the handwritten text chalked on the black walls. These words created the somewhat unsettling talking points for the audience – ‘talking about substance does not make you a person with substance’, ‘I write to forget and it is not possible’, ‘words, in what language?’, and ‘trees…’ The phrases, mixed with Persian text, were introspective, making reading the words seem voyeuristic. As a child of migrants, this installation resonated with me. I remembered stories that seem embedded in my DNA: my father not speaking the language and looking ‘foreign’ and a ‘wog’ as a 1950s Greek arrival in contrast to my mother, the blue eyed blonde, alienated by her German name and accent, a hated interloper in post war Melbourne. Melbourne is my home, but I felt the story of movement and identity as I watched the film and read the walls. There are few things as unsettling than the spectre of homelessness, disruption, exile and reinvention. With economic uncertainty and the images on the news each night of the European refugee crisis, it is hard to turn away and pretend disruption is not in our midst. The group of older women who sat with me as I gave a guided exhibition tour had no migrant experience to share. Yet they were moved, and unsettled, by the installation. Despite what governments and politicians and fanatics may try to tell us, people do care about the refugee crisis, and A few Steps Not Here Not There provoked discussion about what it might mean to start again in exile, where the food, customs, culture and language are very different, and you may be utterly alone. A Few Steps Not Here Not There strips back stories of the courage and tenacity in finding exile to reveal the ongoing vulnerability and fear of the displaced stranger in a strange land. It is this naked authenticity that connects so powerfully with the audience. Enacting the choreographies implicit in the laws that regulate the uses of public space.